I don’t think I can tell people enough that in Celtic iconography the Holy Spirit is often represented as a wild goose. To the Celts of ancient Ireland and Scotland, Ah Geadh-Glas (Wild Goose) was a more apt description of their experience of the Holy Spirit. How caged and docile is your experience with the Holy Spirit, how unlike a dove? I’m sure if I studied the mourning doves that come to the feeder in my back yard I could find the appropriate mystery and wildness in them too, but geese have just spoken to me more in my life. 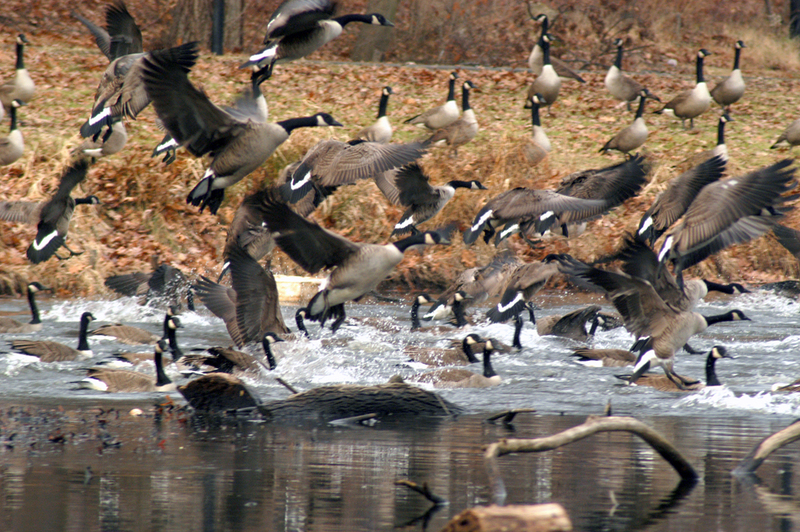 I started my early rising prayer life at Eastern University with the Canada Geese on the pond there. I trained the ducks to eat out of my hand, but the geese would have nothing to do with me. Only the nesting mothers would allow me near them and they scared me with their violent hisses. I’ve come back to the morning geese this fall because, again, I live by a pond (though this one calls itself a lake). The geese are there waiting for me when I rise and then I wait for them to leave. And watching them go is the most wondrous part of them, and the thing about them that for me makes them best to tell the Holy Spirit’s story. They talk about going for a while and it’s not always at the same time. At first I thought it must be the angle of the sun–they usually leave soon after the sun crests whatever treeline it rises behind, but as I paid attention I could tell that it wasn’t nearly so exact. The fun of it is I can tell when they are leaving but I’m never sure of the moment they will go. They flick their heads and grunt at each other, seemingly consulting one another about the every day revelation that it is time to fly to the best grass nearby. Scientists have studied this phenomenon and measured it. One study reported that this period of consultation lasted anywhere from nine to twenty-two minutes. The wild goose then is a perfect symbol for the Holy Spirit because they are common enough (in Ireland and Scotland and Haddon Township, NJ where I live at least) but unpredictable and elusive. They can even bite you. Following the Holy Spirit can feel like an actual wild goose chase, yes, but if we give up trying to catch Her and instead be contented in watching and listening when She happens to be there in the morning (and who knows for how long? ), we will love Her and She will shape us. And in many, many mornings She will still be wild but we may just be tamed. Here’s a poem I wrote for Her. Though uncertain of your path. Walking water in noisy splash. And I’ll wonder at your flying. Flocked with kin above me, pass! O Holy Spirit, Ah Geadh-Glas!